When I head off for my lunch break these days, instead of heading out into the city for an hour of people watching and smoker dodging, I now head in the opposite direction—for the calm and quiet parks or deserted streets where I can plug myself into my phone and listen to a podcast, my absolute favourite of which is called The Dollop. The premise of this biweekly podcast is comedian Dave Anthony telling a crazy American history tale (or Australian when they’re on tour!) to his buddy Gareth Reynolds and, in the process, they have a lot of fun improvising and making jokes. Think you’ve heard of a few crazy stories out of the United States? Well, saddle up, because this podcast will truly blow your mind. This American comedy duo has covered tales of dentistry and childbirth, stupid deaths, religious fanaticism, famous historical squabbles and purely unbelievable situations, as well as scarily real stories of racism, corruption, idealism and journeys of survival. But no matter how grim the subject matter, these two always manage to deliver each episode with due respect, solemnity and tastefulness… unless, of course, the topic deserves otherwise! Speaking of which, do you know the origins of the KKK or the LAPD? Did you hear about the Fenian raids into Canada? What about Rainbow Man? What is competitive tickling? What happened to Hugh Glass and Douglas Mawson? Do Americans have an obsession with ghosts and trying to contact the dead? Why did it rain meat one day in Kentucky? And how many days does it take before a group of hungry escaped convicts start eating each other? 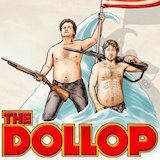 The answers to these questions and many more can all be found on The Dollop. Of course, it is hard to adequately describe in words what can only be heard from these two great masters of storytelling, so I highly suggest you get on iTunes and subscribe to these two larrikins and let them tell you a tale or two. Trust me, you’ll be in stitches for weeks and gobsmacked for longer.